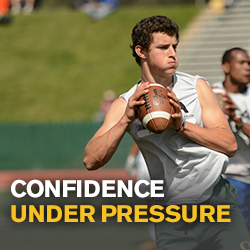 NFA Quarterback Academy provides Fully Comprehensive QB Development Solutions for optimized results! Confidence Under Pressure. Stronger Arm Power. Consistent Accuracy. Dynamic Decision Making. Elite Movement Strategies. Combination Classroom and On-Field Instruction. Classroom Clinics for improved Football Acumen and Powerful QB-Specific Teaching. 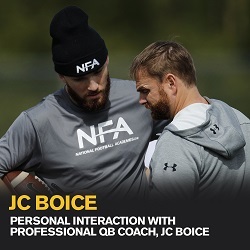 Participants will also receive membership access to the All-New NFA Performance Center featuring online videos and support material for ongoing QB Development and Recruiting Tips. Limited Enrollment to Ensure Personal Interaction and Maximum Reps. QBs work in a small group setting for detailed, personal instruction on every repetition from our QBA Certified Coaches. Quality teaching from our National Recognized QBA Staff. Throw with more Power and Consistent Accuracy. Learn how to apply proper biomechanics and kinetic sequencing to unlock your full athletic potential for improved power, ball speed, and control to put the ball on target! Advanced QB Movement Training. Learn cutting-edge movement strategies to generate explosive mobility both within and outside of the pocket. Learn how to extend plays with improved athletic burst and balance! Detailed Video Analysis of QB Movements! 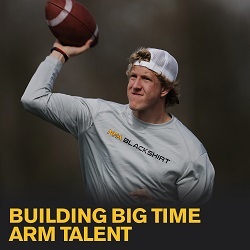 Quarterbacks have their throwing motion scientifically analyzed and assessed, followed up with a personal regimen of QB drills to improve their throwing mechanics for maximized arm power and accuracy. R4 QB Passing System Session: Apply R4 Vision Tools to more clearly see the defense. Be more confident! Use R4 to assess and then attack your opponent. Read coverage better! Use R4 to improve Performing and Decision Making while under pressure! AGES: 10 to 18+ Athletes are placed into age and skill level appropriate small groups. WHAT TO BRING: Football marked with your name. Athletic shorts and a T-shirt. Court Shoes and Turf/Grass Cleats. Water or Recovery Fluids. A PASSION TO IMPROVE! Bring recovery snack/sack lunch. Athletes can eat during the classroom session.